Your reliable helper for cleaning medical instruments. 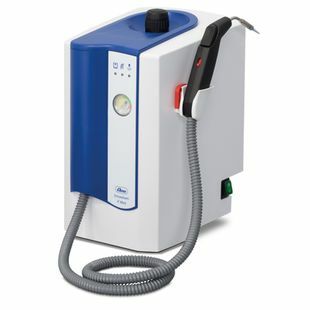 The devices of the Elmasteam 4.5 med series are ideal for pre-cleaning medical instruments that cannot be sufficiently cleaned in the washing and disinfecting unit, or that still have residual contamination after passing through this process. However, the Elmasteam 4.5 med does NOT replace processing in the washing and disinfecting unit. Thanks to the powerful combination of pressure, speed and temperature, microscopic vapour particles penetrate even hard-to-reach gaps, cavities and tiny depressions to thoroughly dissolve contaminants such as blood, grease and tissue residues. No chemical cleaning agents are used, so that no limescale or cleaning agent residues form on the clean surfaces. The Elmasteam 4.5 med can therefore easily clean the lumen of hollow body instruments, even from the inside. For this purpose, instruments with a Luer-lock connection can be directly coupled to the handpiece (with 1.3 m hose) and pre-cleaned. An adapter set is available as an optional accessory for hollow body instruments without Luer-lock connection. The powerful heating performance of the Elmasteam units guarantees constant steam pressure even during intensive use while the sophisticated two-chamber design that separates the water-conducting system from the electrical system ensures maximum reliability. In addition to quality, attention was also paid to user safety, which is confirmed by the TÜV type test according to DIN 61010-1. Elmasteam 4.5 med also carries the CE mark as medical device class I.